Observation - UNKNOWN WATER BUG - UK and Ireland. 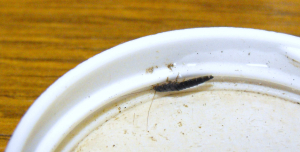 Description: A woodlouse like water bug 8-9mm long,with very long antennae it had air bubble attached to backend and when immobile rested with tail on surface of water. it was very flat no more than 1-1.5mm thick. A woodlouse like water bug 8-9mm long,with very long antennae it had air bubble attached to backend and when immobile rested with tail on surface of water. it was very flat no more than 1-1.5mm thick.